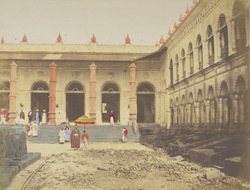 A Hand-coloured print of the Imambara at Hooghly, from the Fiebig Collection: Views of Calcutta and Surrounding Districts, taken by Frederick Fiebig in 1851. Though the title calls this the 'Dwelling of a Mogul merchant, Chinsurah', it is a view of the Imambara at Hooghly. Imambara (houses of the Imam) is the term for a hall in which the Shia festival of Muharram is celebrated, in memory of the Shia martyrs Ali, Hussein and Hassan, and processional shrines are stored. The Imambara at Hooghly was built in 1837 by Karamat Ali, who was the local superintendent, with funds from Muhammad Mohsin, a Shia nobleman. It is large building with a central gateway flanked by two tall minarets, and a large courtyard with a tank in the centre. The walls are covered with Quranic verses.